PECOS, Texas – The Western roots of this west Texas community run deep, and the legacy they hold firmly in the drying soil is magnificent. The volunteers that produce the annual West of the Pecos Rodeo know that better than anybody, and they work hard through the year to showcase it. It will happen again this year with four performances set for 8 p.m. Wednesday, June 27-Saturday, June 23, at Buck Jackson Arena. The World’s First Rodeo is a magical experience, and the committee has been recognized as one of the best in the business. It has been nominated for Large Outdoor Rodeo Committee in the Professional Rodeo Cowboys Association, and members are honored by the recognition. “Just talking about it gives me chill bumps,” she said. “It’s such an honor to be nominated and to be up against all those other great rodeos that are on the list. We are so proud of what we do, but for the cowboys to have nominated us really means the world to me and the rest of the committee. The Carr team has been a strong piece of the Pecos community each June for more than a decade. Pete Carr Pro Rodeo is the largest livestock producer in ProRodeo and has received five nominations for PRCA Stock Contractor of the Year. Over the last five yars, he firm also has had more animals selected to perform at the Wrangler National Finals Rodeo than any other producer. “We have a fabulous relationship with Pete Carr,” McKinney said. “He and his crew are just professional. They make that part of our rodeo so easy for us. They’re so accommodating. That’s an important facet of the rodeo. With such a big variety of events, the Carr team interlaces everything together quite well, giving the fans, sponsors and contestants the best experience possible. This year, rodeo clown and entertainer Cody Sosebee will be a big part of that. He has been nominated for Clown of the Year and Comedy Act of the year, and last year he worked the NFR as the barrelman. And now he joins all the others in the most historic event in the sport. They should be proud. 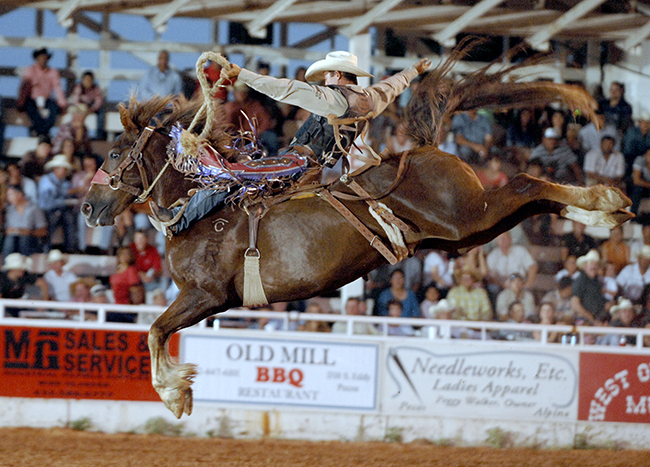 Not only does the West of the Pecos Rodeo have a great history, but it’s got an outstanding future, too.